The Galignanis were among the first to use the recently invented printing press in order to distribute their books to a larger audience. Beginning in 1520, Simone Galignani published in Venice a Latin grammar (the oldest « Galignani » known). However, their greatest success was the Geografia by PTOLEMAUS published in 1597, an incredible bestseller in both the 16th and 17th centuries. Galignani eventually reissued multiple editions. At the end of the 17th century, Giovanni Antonio Galignani, born near Brescia, left an economically declining Venice for London, and shortly after, Paris, where he opened in 1801, on rue Vivienne, not only a bookshop, but also a reading room specialized in the English language, while continuing his publishing business. In addition, there was the creation of Galignani’s Messenger, a daily newspaper and reference point for the English-speaking community on the Continent. Some of the greatest English authors of the time contributed to the newspaper, and their books were also published by Galignani (Byron, Wordsworth, Thackeray, Scott…). Galignani then settled in 1856 at rue de Rivoli, which remains the current address. Upon his death in 1882, William Galignani left the company to his nephew, Charles Jeancourt-Galignani, whose direct descendants still own it today. The newspaper and the publishing house were discontinued at the beginning of the 20th century, but the bookshop continued to thrive. Not allowed to stock English editions during the German occupation, André Jeancourt-Galignani opened a section devoted to art books. Since the post-war period, the Fine Arts Department has been an undeniable success. Today, faithful to tradition, Galignani continues to provide optimal service to demanding clients. 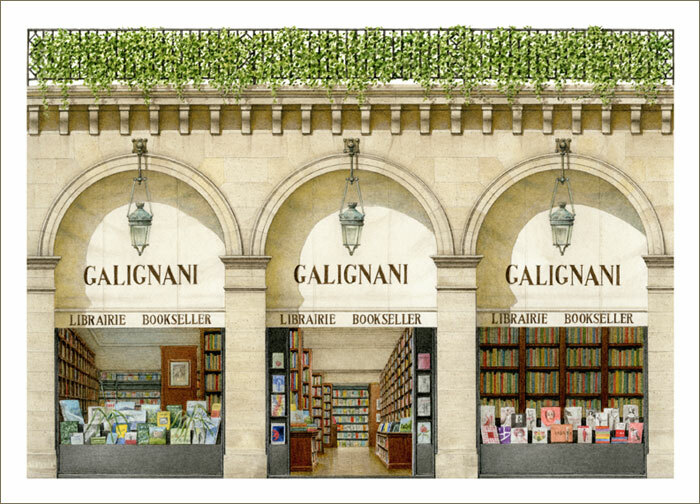 Galignani booksellers, with their selection of Anglo-American books, French and International Fine Arts departments, appeal to some of the most curious, needless to say, cultivated, readers in the French capital… and beyond. If you don’t find the book you need on one of the many beautiful hardwood shelves (dating back to the 1930s…) a specialized service can order it, even if it’s out of print, and ship it all over the world.